Iraqi and Syrian Christian communities in Michigan with connections to persecuted populations in the Middle East reportedly helped President-elect Donald Trump defeat Hillary Clinton in November's elections because of fears of the Islamic State terror group, and the latter's pro-abortion stance. Martin Manna, president of the Chaldean American Chamber of Commerce, said in a report for National Catholic Register that minority Christians were the deciding factor in Trump's narrow win in Michigan, one of the swing states that went to the Republican despite analyst predictions. "I have never seen the enthusiasm we had this year to go out and vote," Manna said, noting that the metropolitan Detroit area has more than 121,000 Iraqis. "Our community voted like it never has." Trump won Michigan by only 10,704 votes, and even though a recount is being threatened in the state, one key area helped flip the result in favor of the Republican. Macomb County has experienced large population growth since 2000, with many new citizens identified as Chaldean Catholics from Iraq. As NCR pointed out, while outgoing President Barack Obama won Macomb County by eight percent in the 2008 elections, there was a 12 point turnaround by 2016, with voters choosing Trump by a 54-42 percent margin. Mana reflected that concerns over the ongoing genocide of Christians and other minorities in Iraq and Syria, along with support for the pro-life position, were the two deciding factors that led Iraqi Christians in Michigan to favor Trump. He noted that although the Obama administration has recognized the genocide, it has "done little" to assist the Christians. At the same time, Trump has promised that he will do everything in his power to defeat IS and drive it out of the territory that it occupies, though he has not revealed his strategic plan. Fr. Paul O'Callaghan, pastor of St George Orthodox Cathedral in Wichita, Kansas, added that "Hillary Clinton was unnecessarily provocative with the Russian president in terms of protecting Christian communities," referring to Clinton's criticism of Vladimir Putin, who has offered to work with Trump to eradicate IS. O'Callaghan revealed that community members also voted for Trump because of his support for pro-life issues, while Clinton has backed the nation's largest abortion provider in Planned Parenthood. "A lot of people told me how appalled they were regarding Hillary Clinton's advocacy for third-trimester abortion. There was a lot of strong feeling about that," the priest said. 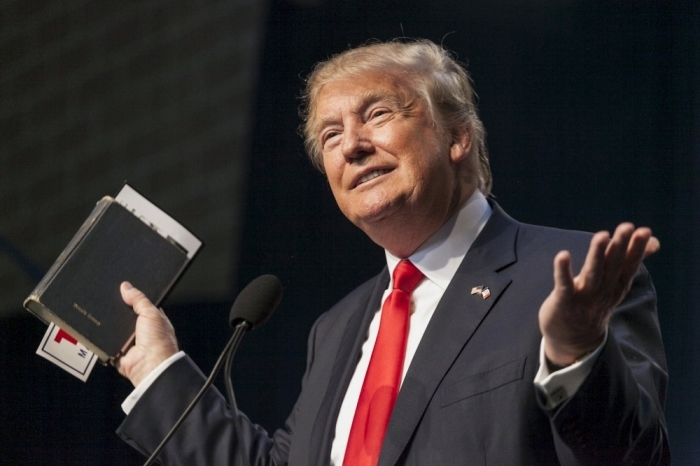 There have been various polls and analysis on the way Christians voted in the November elections, with media reports noting that as many as 81 percent of evangelical voters backed the Republican. As The Christian Post pointed out, however, the 81 percent figure only accounted for white evangelicals; it did not classify how many in this category go to church; and did not account for evangelicals who did not vote. "To clarify, 80% of white people who voted and call themselves 'evangelical' or 'born again' voted for Trump," said Eric Teetsel, who was Senator Marco Rubio's faith outreach director during the Republican primaries, adding that those white people who call themselves evangelicals constitute a "sociological category more than a theological one." "Consider that just 56% of voters who said they attend religious services 'weekly or more' voted for Trump," he pointed out.